On July 21st, 2005, as Banda Aceh’s air burns us, a group of people with their disciplines and unique skills sit huddled tightly in a van heading for a refugee barrack at the Bandara Blang Bintang area, Aceh Besar. They have tried to do something for the children of Aceh, recently afflicted by Tsunami. Along the way they witness tents scattered about and barracks nearly uniform coloring the beach atmosphere filled with pieces of debris. Though seeming tired, they still kept their spirits high with the hope of quickly reaching their destination. They wish to play, sing, dance, and have fun together with children, as soon as possible. At a glance, nothing distinct differentiates them from other NGO activities there. But what the Yayasan Titian Budaya (Sacred Bridge Foundation) does there in cooperation with UNESCO Jakarta has a quite contrasting target and dimension. They try to bridge the bitterness of life’s reality caused by natural disaster with the hope of the future through the language of culture. An interesting learning process occurs, especially when those involved try to interpret each other and understand what “culture” is, exactly. More than that, each person “experiences” various inter-relational “trial” processes upon phenomenal designs, orientations, and realities that they face. Even more so when the achieved work scenario is in the form of something rooted within Aceh’s cultural journey herself. I, as one of the persons involved, wish to share this experience. Unlike the resolution of political conflict with its unending effects upon social life, when the tsunami happened everyone tries to “help” the people of Aceh. Various patterns and shapes of aid are designed and implemented; starting from the physical and moving to encompass various life aspects. “Reconstruction” suddenly becomes a popular jargon heard from various corners. Pamphlets from various local and even international institutions are regular everyday occurences at Nanggroe Aceh Darussalam. Life mobility in the city, paradoxically, are more dominated by physical and social reconstruction. Most Acehnese locals appear to just “sit there” and “watch”. A small number become elite players in the local bureaucracy, while most become working crew. Rationing of food, clothing, educational facilities even the assignment of tsunami leftover “cleaning service”, is needed. Looking at Aceh at this moment it is almost unimaginable that this northernmost corner of Sumatra once had a civilization so renowned that it gave color all through the Nusantara. The “tanding” culture, which at a glance seemed macochitis almost disappears from the Acehnese cultural rhetoric. The “tanding” culture is common in Islamic culture not as something marked by “winning” or “losing”, but is an “arena” to test the validity of a value when introduced in social life. The Aceh people, as like other Indonesian people, have long been “jailed” by a governance system that is very “ruler-centric”. Development is almost totally without any comprehensive consideration involving society’s social dimention. In other words, the national rulers often have a handicap of not recognizing, much less understanding, the people’s needs. Art is a door into an area called by the Sacred Bridge Foundation as a cultural and Psychotherapeutic Healing Program. We involve various disciplines, beginning from anthropologists, psychologists, ethnomusicologist, art programmer, and a number of artisans to interpret this vision. Work design becomes our guideline in mapping needs in the field, and on paper all looks easy. Not so in the field. It is not easy to form the “fitting” thesis to work on. The dialectics between our work design and real needs in the field requires a work program approach in the field where it is redesigned almost daily. Anthropologists map the social needs of children in the barracks which differ from their previous life. Ethnomusicologists explore the various artistic approaches as the main activity. Artists interpret artistic language to fulfill not only practical things, but to also include therapeutic psychological elements. Art programmers design the patterns and formats of classes. Psychologists design psychological therapies, not only through general approach, but also attempting to identify the psycho-cultural aspects of the behavioral characteristics of the children involved. This interdisciplinary work demands patience in listening to, interpreting, and fully understanding all aspects worked on by all parties involved. “If only Brother could arrive earlier, we can hit the Rebana, so that we could shoo away the sound of thunder which had just passed,” so shouts a child in welcoming the team at Muhamadiyah Orphanage, Blang Bintang, Aceh Besar. The honesty, emotionally expressed through the child’s language, displays “culture” not only as what we can see and what we want to do, but also as a “need to share” all experiences of all people involved. After reading the Al-Fatihah together, Syeh Lah Bangguna – a legendary Aceh artist – begins to sing a narrative opening song filled with messages of religion and life morality. Afterwards he sings a pantun repeatedly, followed together by the children. “In heaven there are trees with lush, green leaves, with branches filled with baiduri diamonds; on two of its branches a swing, where gathers the Prophet’s followers…,” thus goes the song. From an esoteric dimention, something repeated becomes the essence of ritual. 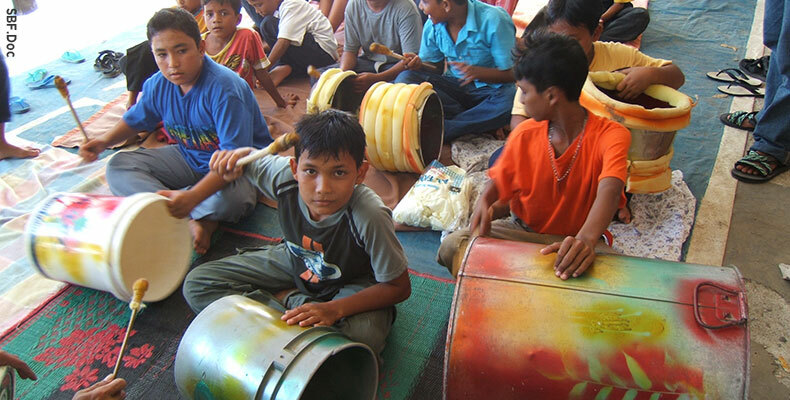 When song is exchanged between Syeh Lah Bangguna and the children, it is obvious that interaction and competition has happened within time and space. Unfortunately, this socio-cultural interaction pattern within Aceh arts have almost disappeared from everyday contemporary Aceh life. Various role models of values for physical or socio-cultural reconstruction all walk alone, as though “fighters” without “sparring partners”. As a result, how can a rhetoric of cultured civilization be maintained? *This article was originally published on Kompas, Saturday, August 6th, 2005 in Bahasa Indonesia.